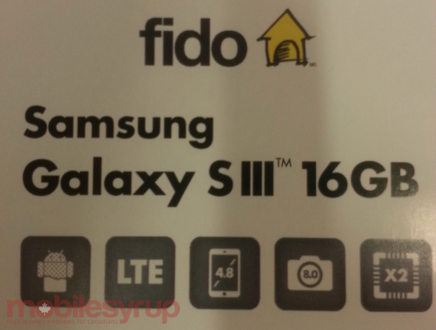 Samsung Galaxy S III heading to Fido? Almost every Canadian carrier has the Samsung Galaxy S III in their lineup: Rogers, Bell, TELUS, Virgin, Koodo, SaskTel, WIND, Mobilicity, Videotron and soon MTS. One major carrier is missing from the bunch, but that might change soon. This name plate arrived at Fido that shows the GS III is possibly coming. However, it also shows the device still rocking Ice Cream Sandwich and the it was recently upgraded to Jelly Bean. We’ll bring you more info on this potential release when we receive it.